Kaua'i CC faculty Wayne MIyata's ceramic artwork sits atop Hall of Compassion in Kaua'i. (Lihue) On September 6, 2013 the Lawai International Center's Hall of Compassion was finally completed with the crowning of its roof with an artistically designed ceramic artwork provided by Kaua'i CC art faculty Wayne Miyata. 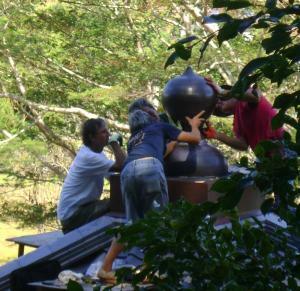 With the help of a crane and specially rigged lifting device, Miyata and volunteers gently installed the huge ceramic ball atop the Hall's roof. 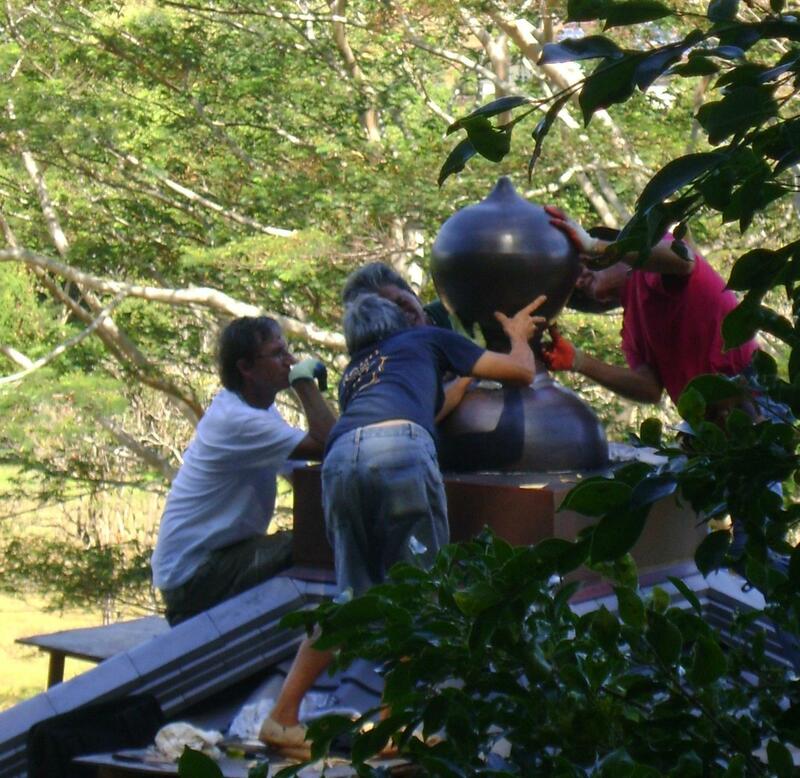 The placement of the sacred ball represents the final phase of bringing to reality a structure that represents the connection of earth and heaven for all. Miyata resides on Kaua'i and recently retired from a distinguished career as head of Kaua'i CC’s Ceramic program. He currently lectures at the College. Miyata is world renowned for his artwork and has held numerous exhibitions locally, nationally, and internationally. Materials for the Hall of Compassion were prepared and shipped from Japan. The unique technique of constructing without nails was used. The project was carefully overseen by architect Nobuyuki Yamamoto, one of the last temple building masters in Japan. The Hall of Compassion graces Lawai Valley, a place where prayers of all ethnicities and religions are heard. In ancient times, Hawaiians built heiau in the Valley. Today, it a place known for 88 shrines replicated from an ancient pilgrimage of 88 temples in Shikoku, Japan. On Sunday, October 6, 2013, from 1:00 pm, Lawai International Center will host its annual Pilgrimage for Compassion, where they will also hold a dedication ceremony for the Hall of Compassion. Contact Lynn Muramoto at LM@hawaii.rr.com. The event is open to the public.